Outsource Equipment Company provides warehouse material handling equipment installation services through professional installers who are highly skilled in the warehouse management system industry and material handling systems. We provide teams of full-time material handling installers and certified forklift operators, all highly trained and skilled – and all employees are OSHA certified. These manufacturer-certified installers will ensure that your material handling equipment, warehouse management system or pallet racking is properly installed and that everything is operating smoothly. We know that our job isn't finished until you’re up and running. Each team is overseen by the on-site project manager, who is responsible for ensuring your job is done safely and on-time. Regardless of whether you purchase new or used equipment from Outsource Equipment, you will receive the utmost in professional courtesy and technical know-how. 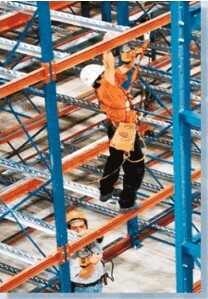 At Outsource Equipment Company, we stand behind our custom material handling installation work. 100% job satisfaction is our goal. In order to ensure the quality of our warehouse racking installation, we continually provide training for our installers and use only state-of-the-art tools and lift equipment. It is our commitment to quality that enables us to guarantee you will be 100% satisfied with our warehouse installation services — regardless of which warehouse management system you select, material handling solutions you choose or material handling equipment you purchase. You’ll be more than satisfied whether we install used pallet racking or a major piece of brand-new material handling equipment. We understand that it is important to get the job completed on time – but in addition to being completed on time, each material handling installation project must come in on budget. We offer a competitive pricing schedule that ensures a consistent installation price. We have material handling installers strategically located throughout the U.S., which enables us to provide fast, reliable service anywhere in the country. Contact us today about warehouse installation services!